I don’t care what the circumstances are, every single night I need to end the evening on a sweet note. Truth be told, my body just doesn’t enjoy or tolerate sugar well these days, probably because I don’t eat much of it anymore, but I still have a sweet tooth that begs to be satisfied when Joe and I crash on the couch at the end of the evening. Usually I try to keep my little nightly “dessert” to around 200 calories and like for it to have some sort of nutritional value, too. Meaning I rotate fruit and Greek yogurt with honey, dark chocolate, a spoonful of nut butter, etc. on the regular. But the other night I was craving something different, and behold this chocolate mug cake was born. 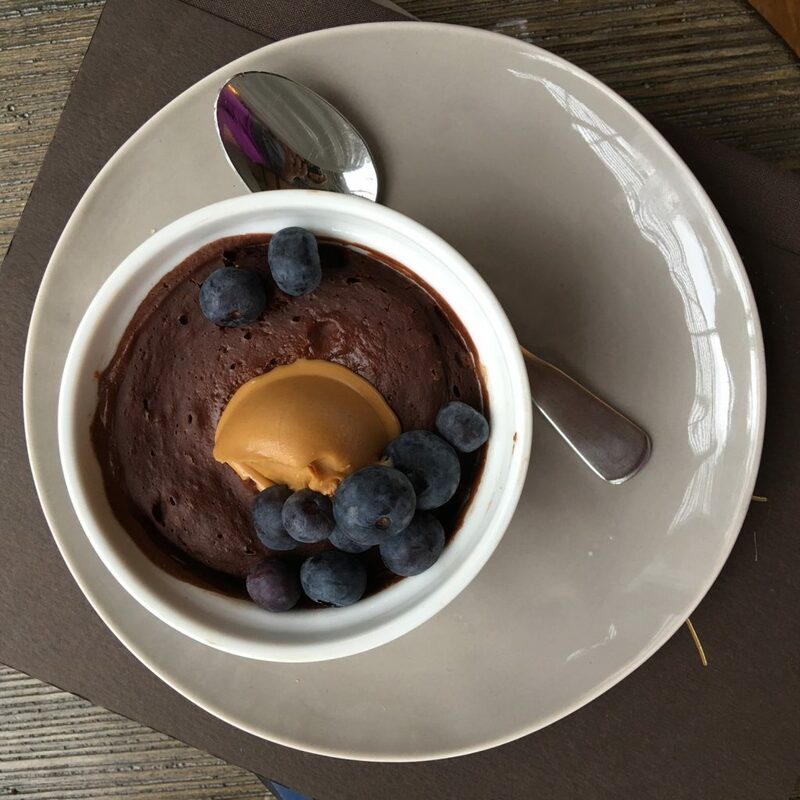 A lot of the recipes that I’ve found on the web for “mug cakes” are actually pretty indulgent and hardly healthy – usually containing plenty of oil or butter, sugar, all-purpose flour and more. Hardly what I look for when I’m going for a healthy dessert. This recipe comes in around 120 calories without the toppings (I highly suggest a spoonful of peanut butter and some fresh fruit!) and tastes like a dense, rich flourless chocolate cake of sorts. I don’t want to over-promise here, because it is a healthy dessert, but it’s totally crushing my cravings for chocolate each night and doesn’t leave me with a pre-bedtime sugar crash. Total win, right? I LOVE dark chocolate, so two tablespoons of cocoa powder is right up my alley. However, if you prefer a milder chocolate flavor, don't hesitate to use the suggested swap mentioned in the recipe, substituting a little chocolate protein powder for a bit of the cocoa powder. Toppings: Peanut butter, fresh fruit, dollop of Greek yogurt, chopped chocolate, etc. In a ramekin or small bowl, combine the dry ingredients until well combined. Add the water and stir until smooth. Microwave 35 to 45 seconds or until the edges are set and center is almost set but the very middle is just slightly gooey looking. Top with a scoop of peanut butter and fresh berries, or desired toppings as suggested above and enjoy! Sounds great! Do you have an alternative to the pre-made pancake mix? Also pregnant with baby #2, and I’ve really appreciated your healthier snack and meal ideas!! Especially this one. Just made it tonight (one for me, one for my hubs)! We loved it!! To my momma friends, on the hard days.